Amb. Philippe J. Lhuillier (second from left) and the other Ambassadors of the ASEAN Committee in Madrid (ACM) meet with Hon. Maria Reyes Maroto, Spanish Minister for Industry, Trade, and Tourism. Philippine Ambassador to Spain, H.E. Philippe J. Lhuillier, and the other ASEAN Ambassadors in Madrid paid a courtesy call on the Spanish Minister for Industry, Trade, and Tourism, Hon. Maria Reyes Maroto Illera. The call was organized by the ASEAN Committee in Madrid (ACM), which includes the five resident ASEAN Ambassadors in Spain from Indonesia, Malaysia, the Philippines, Thailand, and Vietnam. 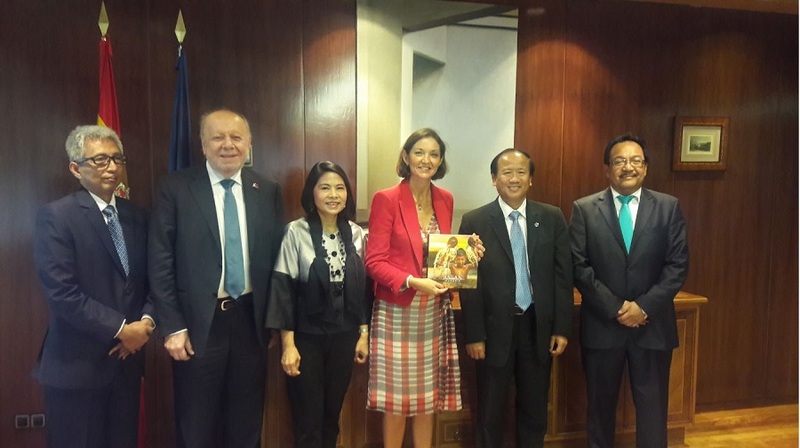 During the meeting, the ACM introduced itself to Minister Maroto and outlined its objectives for promoting ASEAN trade and tourism in Spain, and its intention to raise awareness about ASEAN in general. The ACM mentioned that it had already conducted business seminars in Barcelona, Segovia, and Valencia to this end. In support of this, the ACM presented a joint non-paper that listed several proposed initiatives for the Minister to consider. The ACM added that the Spanish business sector was already working on its own to form the ASEAN Business Chamber, in consultation with the members of the ACM. Each Ambassador then spoke in turn about their respective country and economy. For his part, Ambassador Lhuillier mentioned that the Philippines and Spain had just concluded an Air Transport Agreement and expressed his hope that this would promote trade and tourism between both countries. He also highlighted the administration’s flagship Build, Build, Build infrastructure program and stated that the Philippines was open to the entry of more Spanish firms. Ambassador Lhuillier invited Minister Maroto to send a high-level business delegation to the Philippines, in order to see the opportunities available. He concluded by noting that the PH-Spain MOU on Economic and Financial Cooperation was on the verge of finalization and stated that this could lead to more economic cooperation agreements, such as the establishment of a Joint Economic Commission between both countries. For her part, Minister Maroto welcomed the ACM’s initiatives and agreed to form a Working Group between her Ministry officials and the ACM in order to implement concrete proposals and create a Plan of Action for 2019 to 2020. She stated that Spain is highly committed to implement the European Union’s trade agenda with ASEAN states and a future EU-ASEAN Free Trade Agreement. Minister Maroto also mentioned her desire to have mutual trade and industry development activities between Spain and ASEAN states. The meeting ended with a commitment from both the Ministry and the ACM to form the Working Group and start on a joint Plan of Action to cover the next two years. Minister Maroto was an associate professor of economics at the Universidad Carlos III de Madrid before her election as deputy to the Assembly of Madrid in May 2015 under the Spanish Socialist Workers’ Party (PSOE). During her time as a legislator, she served as spokeswoman of the Committee of Budgets, Economy, Finance, and Employment. She resigned her seat upon her appointment as Trade Minister by Prime Minister Pedro Sanchez in June 2018.